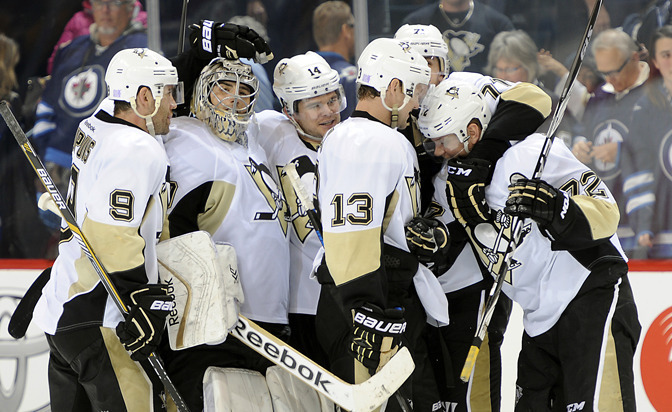 The Pittsburgh Penguins seven-game winning streak is helping fantasy teams everywhere. They have outscored their opponents 32-8, their top-rated power play has scored 13 times in 34 attempts, their penalty kill has been successful on all 25 shorthanded opportunities and they have only trailed for 19:18 during the streak. Individually, the top line of Sidney Crosby, Chris Kunitz and Patric Hornqvist has combined for 13 goals, 22 assists and a plus-22. Defenseman Kris Letang has eight points and goalie Marc-Andre Fleury has given up only seven goals in six starts during the streak, while stopping 149 of the 156 shots faced (.955 save percentage). The Penguins play the New York Rangers on Tuesday, followed by back-to-back games against the Toronto Maple Leafs, then the Rangers again on Friday and Saturday. Fantasy owners should continue to have high hopes. The 2014-15 NHL season is in full swing, so NHL.com has you covered with weekly fantasy hockey positional rankings, real-time spin updates and waiver wire advice. Reilly Smith, Boston Bruins (owned in 24 percent of Yahoo leagues) -- Owners were skeptical about Smith's ability to follow up his career year of 2013-14 that saw him score 20 goals and 51 points. As a result, he was drafted on average in the 14th round and in only 13 percent of Yahoo Leagues. And when the 23-year-old only had three points in his first nine games he was taken off the fantasy landscape as an option. Now playing on a line with Patrice Bergeron and the red-hot Brad Marchand, he has five points in his past six games. The Bruins have a busy week with four games (NJD, @TOR, @MTL, CAR), so expect the great chemistry to flourish with this hot Bruins line. Marek Zidlicky, New Jersey Devils (owned in 34 percent of Yahoo leagues) -- Much has been written about the rookie phenom Damon Severson and his rise to fantasy fame, but Zidlicky is quietly putting up numbers that cause for a spike in ownership. After starting the season with three points in his first seven games played, the 37-year-old has five points in his past seven games. He has 198 career power-play points with a team-leading two power-play goals this season. The Devils have four games this week (@BOS, MIN, @WSH, COL), making now a perfect time to pick up Zidlicky and get some offense from your defense. Cam Ward (owned in 29 percent of Yahoo leagues), Carolina Hurricanes -- When the calendar flipped to Nov. 1, Ward was 0-3-1 with a 3.95 goals-against average and .840 save percentage. Predictably, he was not on many fantasy teams. Since the start of the second month of the season, the 30-year-old is 4-0-0 with a 1.48 GAA and .944 save percentage. Two of those four wins came against the injury-riddled Columbus Blue Jackets, so temper your expectations, but allowing only four even-strength goals during that run shows much improvement from Ward. The Hurricanes have four games this week and only one back-to-back (CGY, WPG, @BOS, SJS), so expect the 10-year veteran to start three of four and win at least two of those starts. We're going streaking -- Evgeni Malkin of the Penguins had his seventh stretch of recording points in 10 or more games. The Blue Jackets' Ryan Johansen had a point in a franchise best 10 straight games. Jakub Voracek of the Philadelphia Flyers had a five-game point streak, which was followed by his current eight-game point streak. Keep an eye on streaking players, especially ones not highly owned, like the Calgary Flames' Sean Monahan, who is only owned in 30 percent of Yahoo Leagues, and the Carolina Hurricanes' Elias Lindholm, owned in just eight percent of Yahoo Leagues, but each of whom have points in five straight games. Ride those point streaks, but for the lesser-owned players, don't be afraid to find the next player on a strong run and keep riding the high waves of a long season. Sell high -- All this talk of streaks makes smart fantasy owners flip those assets for a long-term improvement of their team. One candidate to sell high is Tampa Bay Lightning sophomore Tyler Johnson, who had 11 assists in 12 games in October and has started off hot in November. A concern for Johnson, though, is a possible reduction in ice time if the Lightning decide to move Valtteri Filppula back to center and if rookies Jonathan Drouin and Vladislav Namestnikov improve. On defense, Keith Yandle leads the Arizona Coyotes in points (11 in 14 games). Find a team in your league in dire need of defensive scoring and you could get a goalie or top forward. In net, Ryan Miller became the first Vancouver Canucks goalie to win 10 of his first 11 games, but fantasy owners can't forget he went 1-5 in April last season to cost some teams a fantasy championship. Filip Forsberg, Nashville Predators -- The player once traded for Martin Erat is finally making a name for himself in the NHL. He is the rookie leader in points (15), plus-minus (plus-15) and shots on goal (41) and is also tied for the League lead in rookie assists (9) and power-play points (four). The 20-year-old has been playing on the Predators top scoring line with new additions Mike Ribeiro and James Neal. The 11th pick of the 2012 NHL Draft is proving he was well worth the wait and has been giving fantasy owners who picked him off the waiver wire (only drafted in three percent of Yahoo leagues) a much added boast.